The terms ‘NotJustQuiltZ or ‘we’ or ‘us’ refer to the owner of this website at www.notjustquiltz.com. The term ‘you’ refers to the user or viewer of our website. Check out our Gallery of New Arrivals! – Come see our newest line of unique fabrics. These marbled cotton fabrics from Quilting Treasures are wonderful! We bought 8 different colors so you would have a wide variety to choose from. 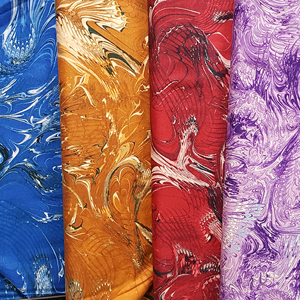 And, rather than pay high prices for the hand-marbled fabrics that you see at the quilt shows, these fabrics are $12.95 per yard on good quality cotton. Check them out.